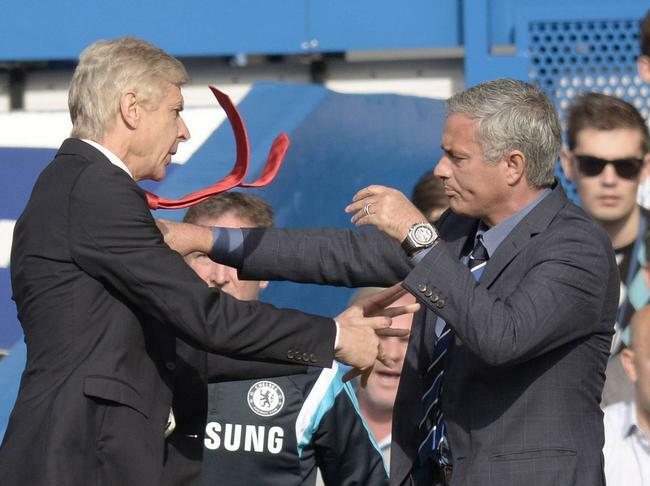 Arsene Wenger and Jose Mourinho hate each other. In fact, their rivalry has become so intense that after Arsenal beat Chelsea in the Community Shield on Sunday, the two managers couldn’t even bring themselves to shake hands. Chelsea manager Jose Mourinho decided to congratulate each individual Arsenal player after they’d lifted the shield, but when it came time to shake Wenger’s hand he conveniently made sure to look the other way. After shaking around a dozen Arsenal players’ hands as they walked down the staircase at Wembley following their 1-0 victory over his Chelsea side, Mourinho was expected to do just that with Arsene Wenger. However, the Frenchman simply walked past his Portuguese counterpart, who in turn had his back to Wenger. And clearly the crowd that had gathered at Wembley to watch the encounter between the two famous London clubs saw the pair ignore each other because after they’d walked past one another a huge cheer let out. This isn’t the first time that Arsene Wenger and Jose Mourinho have shown their disdain for each other on a very public platform. Not only have they repeatedly insulted each other in press conferences, but during a match last season, Arsene Wenger even physically confronted Mourinho on the sidelines. Arsenal’s victory over Chelsea at Wembley on Sunday, which came courtesy of an Alex Oxlade Chamberlain strike in the first half, was the first time Arsene Wenger’s Arsenal had beaten Jose Mourinho’s Chelsea in 14 attempts.